The twenty one year and five month career of D7633/25283/25904 began with one year allocated to Sheffield area depots, the remainder being allocated to a variety of London Midland depots, particularly in the north-west area. Built: Beyer Peacock, Manchester, No.8043. Dual brake equipped (at least by 1972). Angled strip at bottom of cab doors. Time between last Classified repair and withdrawal: 98 months. October 1967 to Springs Branch (8F). June 1968 to Liverpool Division (D08). August 1972 to Birmingham Division (D02). December 1972 to London Division (Western Lines) (D01). February 1973 to Liverpool Division (D08). Renumbered to 25283 February 27th 1974. Renumbered to 25904 November 12th 1985. After withdrawal 25904 was stored at Basford Hall Yard until moved with 25059, 25323 & 25902 on July 3rd 1987 to Leicester Humberstone Road Yard and into Vic Berry's Yard on July 6th 1987. 25904 left Vic Berry's yard on December 16th 1987 for preservation. Noted Derby Works June 1972. Noted Crewe Works January & February 1974 (full repaint). Noted Glasgow Works December 1978 (Classified). Noted Derby Works July, October & November 1983 (N6 repairs, bogies). Condition: June 1972 two-tone green livery with full yellow cabfronts, 'D' prefix still present, already dual brake equipped. Any passenger workings handled by D7633/25283 during its first eight years appear to have escaped documentation. The first recorded working took place on September 16th 1972 with 7633 & 5224 working the 14.30 Yarmouth - Walsall from Norwich. One other passenger working prior to renumbering took place on July 15th 1973 with 5190 working a Wellington - Southend excursion to Nuneaton. Photograph courtesy Tom Sutch. A wonderful study of 7633 inside the depot at Springs Branch on August 11th 1973. Of interest is the battery box having been slid out to allow maintenance on the batteries, the patched up two-tone green paint work with several shades of green, the 'D' prefix still present almost five years after steam ended on BR, the contrasting blue data panel and there appears to be no BR emblem on the bodyside. 40146 & 25283 were noted working an Ince & Elton - Hopetown freight on January 3rd. 25283 then went to Darlington depot prior to taking out the return working to Ince & Elton later that night. On February 21st the 13.57 Leeds - Morecambe diesel multiple unit required assistance from 25283 forward from Skipton. The extreme weather conditions in the south west brought a series of problems affecting timekeeping. Most unexpected was the use of Springs Branch allocated 25283 to rescue failed 50018 on January 13th's 13.21 Liverpool - Plymouth, arrival was two hours late at Exeter, where both machines were replaced by 45071. On the evening of Monday July 4th the 6E32 Corkickle (Marchon Products) - West Thurrock with 25283 & 25222 derailed seven of its ten bogie soda ash tanks at Braystones. The tankers were loaded with sodium tripolyphosphate, a chemical used in the manufacture of detergent. Apparently a small bridge failed as the train was crossing, derailing many of the tankers, sending some crashing down onto several beach cottages on the west side of the line. Fortunately the bungalows were not occupied at the time, ironically these bungalows were built by the Furness Railway. A considerable length of track was damaged, a bus service operated between St. Bees & Sellafield, it took nine days for the track to be repaired and normal service resumed. Photograph courtesy Ian Marsh. Two views of 25283 & 25222 at Whitehaven Preston Street on July 3rd 1977 and in the North Sidings at Sellafield on July 4th 1977 with the remains of its train of bulk tankers. The previous day the rear of the train had derailed very badly at Braystones. 25097 & 25283 were noted on a 'Weekly Herald Special' at Barrow in Furness on October 1st. On May 26th 25283 worked an unidentified Crewe - Cardiff service. Three months later on August 28th 1978 25283 worked the 17.33 Dundee - Glasgow Queen Street. 25283 & 25318 were in charge of the 07.35 Toton – Halling coal as far as Hither Green on February 26th, returning with the 10.57 ex Shepherdswell. The North Wales and Cambrian lines were visited during 1979. On July 19th 1979 25283 worked the 18.17 Llandudno Town - Manchester Victoria, followed on July 28th by the 10.40 Manchester Victoria - Llandudno Town. On August 18th 25283 & 25036 worked the 04.15 Shrewsbury - Aberystwyth, returning with the 10.09 Aberystwyth - Euston to Wolverhampton. The next day the same pair worked the 08.45 Birmingham New Street - Barmouth and 17.45 Barmouth - Euston as far as Wolverhampton. On May 23rd 25283 hauled Coal Tank No.1054 (in steam) from Dinting to Bold Colliery for the Rocket 150 cavalcades. The next day (24th) 25283 worked the 09.42 Llandudno Town - Manchester Victoria, the 14.40 Manchester Victoria - Llandudno Town and the 18.17 Llandudno Town - Manchester Victoria. 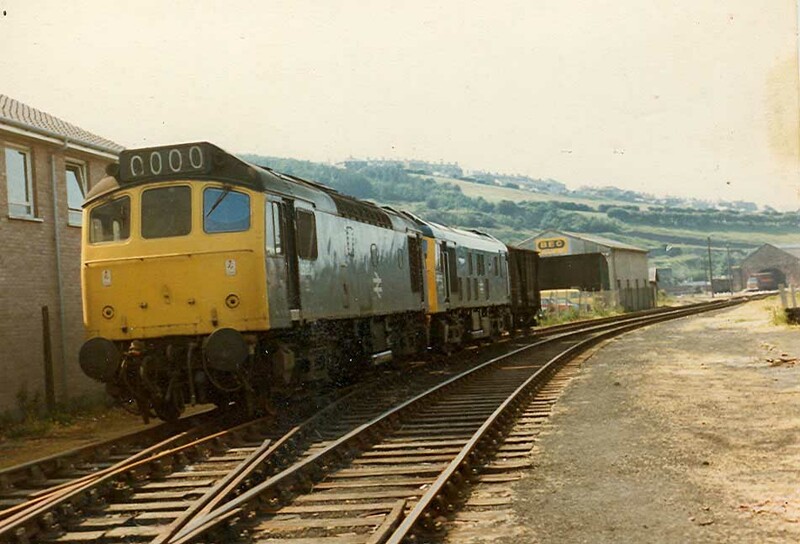 On June 7th (or 17th) the 17.10 Cardiff - Crewe failed at Ludlow behind 25323, the following 13.20 Cranmore – Ellesmere Port with 25283 & 25318 pushed the train to Craven Arms where the two Type 2s took over the Crewe service. A run over the Cambrian lines followed about a month later. On July 12th 25283 & 25327 worked the 07.40 Euston - Aberystwyth forward from Wolverhampton, returning with the 17.55 Aberystwyth - Wolverhampton. In the March area, the Mountsorrel – Kennett stone trains were frequently double headed, so noted were 25283 & 25298 on January 29th. No passenger workings during 1981 have so far been noted for 25283. 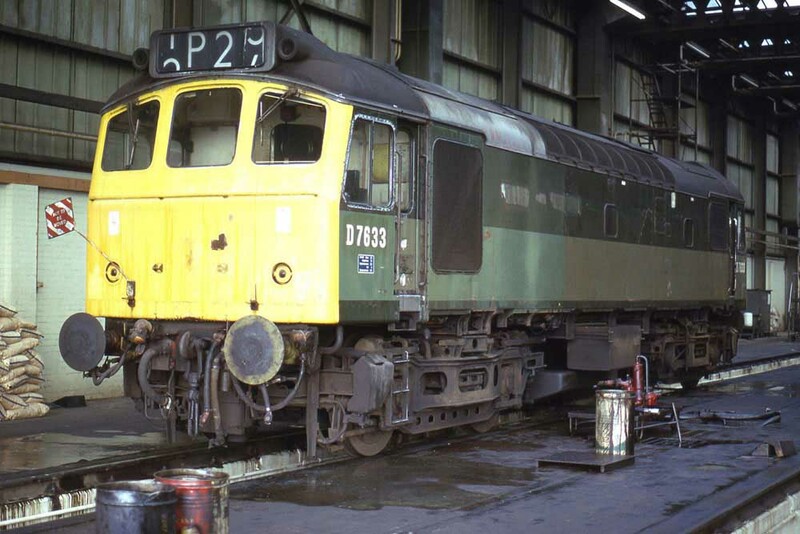 During November 25283 received an 'E' examination at Tyseley. Industrial action on February 18th found 25283 stabled at Llandudno Junction along with many diesel multiple units. A rescue job occurred on March 9th when the 17.26 St. Pancras - Derby failed at Bedford behind 45128, the train was dragged to Derby by 25283. On July 31st 25283 & 25288 worked the 07.38 Shrewsbury - Aberystwyth, returning with the 10.07 Aberystwyth - Euston to Wolverhampton. On May 26th 25309 & 25283 were noted passing Guide Bridge with a cement working. Old and new graced the Cumbrian Coast line on January 6th when 25283 took APT power car SC49005 from Shields to Crewe. On May 21st 25283 was stabled at Bescot. On May 26th a fourteen hour vigil of movements at St Albans revealed just three Class 25s in action, 25283, 25301/316, all on freight workings, with 25283 hauling 49 empty 16-ton wagons northbound. During October 25283 visited Derby Works to recieve a bogie from 25247. 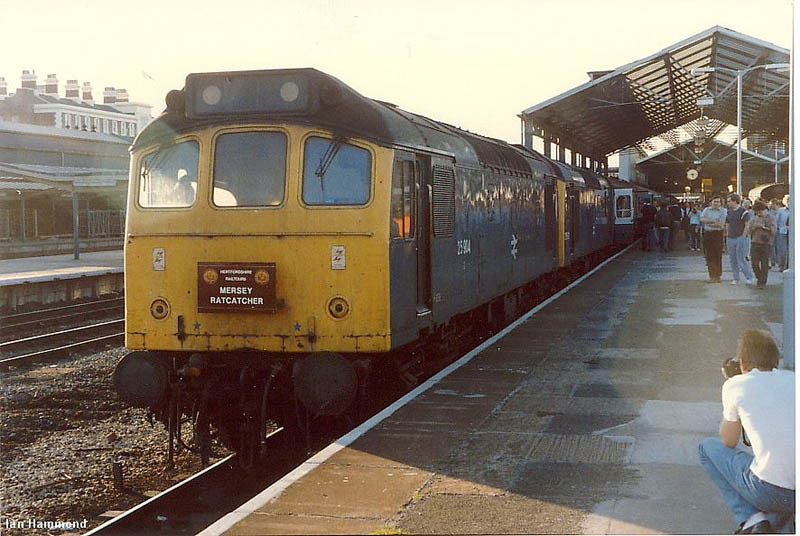 Pre-Christmas travellers on December 23rd 1983 had 25283 on the unheated 16.06 Crewe - Cardiff, returning after the Christmas break on a Penzance – Crewe Parcels (28th). On a snowy December 28th 25297 & 25283 were noted at Greenholme with oil tanks (Stanlow - Bishopbriggs?). On a snowy January 17th 25283 was stabled at Motherwell. 1984 brought a mixed bag of workings starting with two over the Cambrian line. On May 6th 25283 & 25276 worked the 07.30 Euston - Aberystwyth charter from Wolverhampton and returning to Shrewsbury Abbey Foregate Junction where 25154 replaced 25276 to Wolverhampton. The next day (7th) 25283 & 25265 worked the 07.30 Stratford on Avon - Aberystwyth day excursion from/to Wolverhampton. 25283 was stabled at Llandudno Junction on May 11th. A diesel multiple unit failure on August 16th saw 25283 work the 18.05 Morecambe - Leeds. 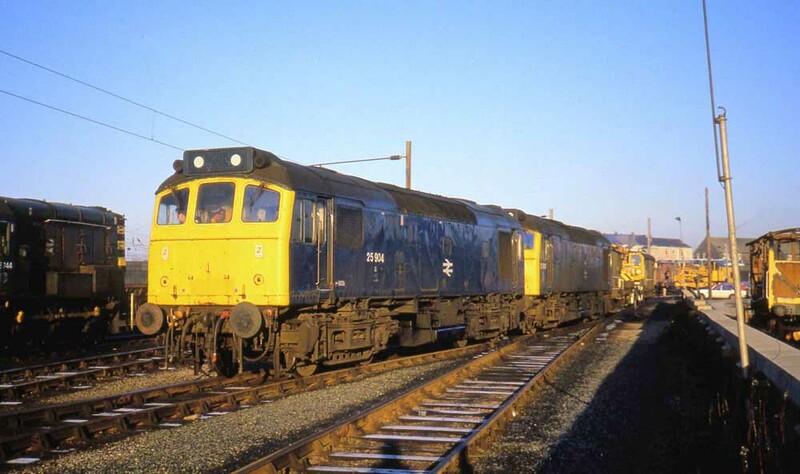 The final working for 1984 took place on October 7th with 25283 assisting the 17.10 Glasgow Central - Euston between Lockerbie & Carlisle after the power had been turned off for engineering work. 25269 & 25283 were noted at Chester General with a Ravenscraig - Shotton coil train on October 12th. On February 1st 25283 worked a round trip over the Cardiff - Crewe line. On a snowy February 20th 25285 was noted at Nuneaton with a short engineers train. On May 8th 25283 worked the T48 Soho - Langley Green trip working. 25283 was stabled at Nuneaton station on May 25th. On July 9th 25283 worked the 3V20 15.10 Manchester Piccadilly - Bristol Temple Meads parcels. 25283 was noted at Warrington Arpley on July 24th and at Birmingham New Street on July 31st. The second week of August was quite busy for 25283 north of the border. Three workings involved the 10.41 Exeter St. Davids - Edinburgh relief, worked between Carstairs & Edinburgh, on August 7th with 25303 and on August 9th & 12th with 25257. On August 16th 25283 was noted at Stockport with a engineers train. Later the same day the 18.15 Glasgow Central - Manchester Victoria proceeded from Preston with 25283 but got no further than Ribble Bridge where the locomotive failed and reversed back to Preston to be replaced by 47608. On August 19th 25283 was north of the border again working a Glasgow Central - Carlisle service. On August 28th 25283 was noted southbound passing Springs Branch with four short wheelbase bulk powder wagons. Present at a very warm Coalville Open Day on September 1st were 97201 & 25283. And finally for 1985 on September 7th 25283 worked the 06.28 Crewe - Cardiff. On October 21st 25283 & 25286 were noted passing Crewe with a freight train. On the evening of October 28th 25283 & 25288 were noted passing Hereford with oil tanks. The changing nature of the organisaton of British Rail led to a new idea, one of Sectorisation, which in its most visible form saw the creation of specialised locomotive pools to handle specific traffic flows, with the locomotives renumbered to recognise this fact. These pools would handle a variety of traffic flows. One such pool was established at Motherwell in March 1986 for British Steel traffic using dedicated Class 37/3’s, whilst in April 1986 eight Class 20/3’s were fitted with modified triple valves for handling limestone traffic from Tunstead. 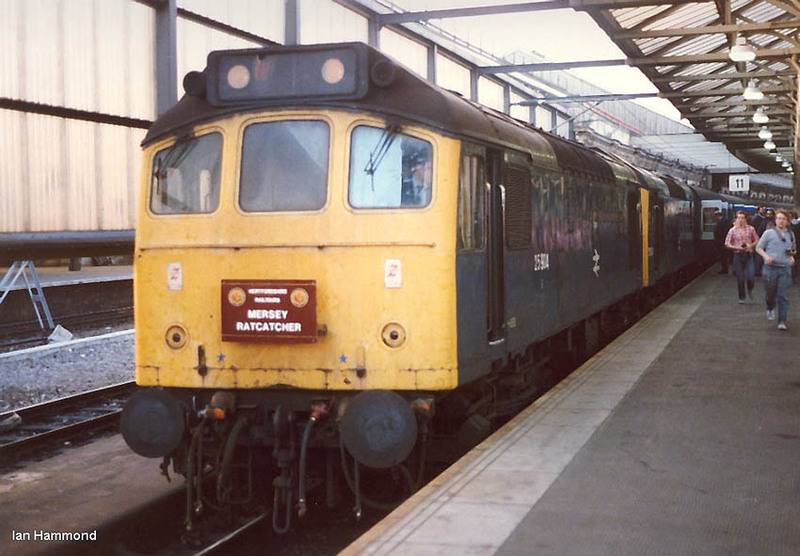 However the original pool, based at Kingmoor Yard was created late in 1985 involving a dozen Class 25’s for dedicated freight traffic in the north west, the locomotives owned by a BR subsidiary, Railhaul Ltd. All the remaining Series 3 machines were load bank tested at Crewe depot, with cylinder peak pressure, electrical machine condition and tyre wear being closely checked. Twelve were selected, with six spare and given ‘E’ exams at Crewe or Carlisle to handle traffic for the Chemicals sub-sector based at Kingmoor. They were restricted to 60mph to mitigate traction motor problems and were to receive preferential maintenance. Renumbering took place commencing in November with the re-numbering of 25283 to 25904 on November 12th but the traffic they were assigned to handle diminished rapidly. ICI lost the rock salt contract from Over & Wharton, sulphur imported through Mostyn Dock ended in 1987. The Speedlink traffic between Dumfries and Carlisle came under critical review and the proposed purlite and sugarstone traffic never materialised. Regional control at Crewe established some diagrams based on Warrington and Garston, involving much oil traffic out of Stanlow. Once this particular ‘Sectorisation’ plan was cancelled the BRB mandated the 25/9s be treated like any other Class 25. The first working for 25904 after its renumbering was November 13th's Bardon Hill - Ellesmere port tank train, working forward from Crewe. 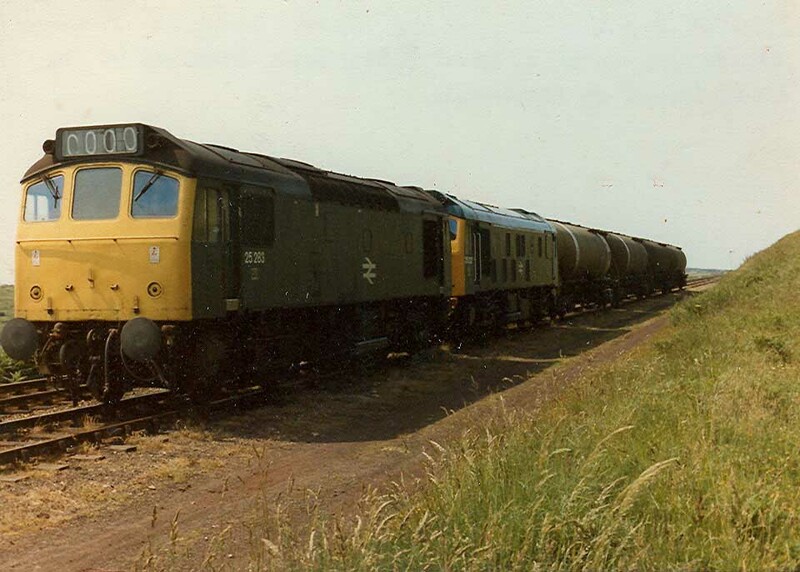 Following this 25904 & 37084 worked a Stanlow - Leeds oil tanks. On November 30th 25904 was stabled at Guide Bridge. On December 4th a Stanlow - Dalston oil train was worked to Warrington by 97408 & 25307, here 25904 & 25912 took over for the run to Dalston. Class 25s visiting the Huddersfield area in early December included recently renumbered 25904 on 12th. 25904 was stabled at Saltley on December 19th, the following day (20th) being used the Camp Hill banker. 25904 was stabled at Bescot on December 26th. 25902 & 25904 were noted at Warrington Arpley yard arriving with oil tanks on February 7th. On April 3rd 25904 was noted working the 13.38 Preston Deepdale - Warrington Walton Old Junction Speedlink. On May 7th 1986 the 23.05 Glasgow Central - Euston was worked between Warrington & Crewe (via Chester) by 25904 & 25912. On May 9th 25904 was noted at Warrington Arpley. 25904 & 25907 were noted at Warrington Arpley on July 21st. On September 3rd 25904 & 25910 were noted eastbound at Chester with the afternoon Llandudno Junction - Warrington Arpley freight. Four Class 25s took part in the very last Class 25 railtour, Hertfordshire Railtours ‘Mersey Ratcatcher’ (1Z30) of September 28, 1986. The tour started in Euston behind 25313 & 25249 running as far as Birmingham International where 86237 took over for the trip to Birmingham New Street. This odd move was created due to construction at New Street closing the west end of the station making run rounds difficult. 25313 & 25249 came back on the train heading to Leicester, Derby, and over the Hope Valley line to Manchester and Liverpool Lime Street. Here 25904 & 25910 made the short run down to Crewe, via Chester, where the original pair took up the final run to Euston via the Trent Valley line, completing a day of 490 miles of Class 25 haulage. Photograph courtesy Ian Hammond. Two views of the Mersey Ratcatcher with 25904 & 25910 at Chester (left) and Crewe (right) where they await detaching from the train prior to the original pair taking the train back to Euston. On October 1st a Stanlow - Leeds oil train was noted at Horbury Junction behind 31229, 25904 & 25906, presumably one of the Class 25s was not well. 25904 was noted at Ashton branch sidings with several bogie ballast hoppers headed for Newton Heath on October 4th. 25904 & 25901 were stabled at Warrington Arpley on November 16th. 25904 was stabled at Warrington Arpley on December 31st. 25903 & 25904 were noted light engines through Crewe on January 3rd. Photograph courtesy Tom Sutch. The morning of January 7th 1987 dawned clear, bright and frosty at Wigan as 25904 & 25903 go to work with a short engineers train. This pair of locomotives had been together since December 29th 1986 and remained this way at least until January 8th 1987 when they visited Crewe depot and were presumably split up here. On January 31st 25904 worked a loaded lengthy ballast train from Penmaenmawr to Llandudno Junction. On a cold February 20th 25904 was noted at Sandbach West Junction with a lengthy train of mineral wagons headed for Lostock Yard. The final passenger working took place on March 4th 1987 with 25904 working the 23.15 Crewe - Preston forward from Warrington following an electric multiple unit failure. At lunchtime on March 12th 25904 was at Ellesmere Port, with 25903. On March 17th 25904 had worked the 7V52 17.12 Sellafield - Bridgwater as far as Gloucester, the next day (18th) the 9G12 Crewe Basford Hall - Bescot and was noted at Manchester Victoria on 19th before running light to Wigan for 6L58 Wigan - Castleton CWR depot with eleven empty YEA wagons. It returned to Manchester before being sent to Crewe on evening of 20th. However the next day it reached Chester to handle Sunday ballast work at Connah’s Quay, withdrawal would come early on Monday 23rd. It was on March 23rd 1987 that 25912, 25059 & 25904, (the first two still running) moved from Crewe Depot to Basford Hall yard to join a line of their silent sisters. No.2 cabfront: 25283 handpainted on cabfront above bufferbeam, mixed sized numbers: noted November 30th 1985 - painted over by May 1986 (possibly much earlier than this date). Page added May 22nd 2013. Last updated April 1st 2019.